Vehicle advertising has become popular for businesses. It is not uncommon to see vehicles covered in glossy, colorful advertisements in Tucson. Interestingly, vehicle graphics and wraps are not only memorable but attain significant mobile impressions with minimal investment. If done well professionally, vehicle graphics and wraps can give your brand a substantial amount of exposure. What should I do to reap optimal results from vehicle graphics and wraps? Here are 5 vital tips on how to attain the best vehicle graphics and wraps. Get your Font Size right. Vehicle graphics and wraps are meant to communicate your message to your niche audience. One of the best ways of achieving your objective is by ensuring that your lettering is of the right font size. Remember, your target audience needs to read and understand your mobile message within 10 seconds or less. For this simple reason, it is essential to ensure that all letters are of optimal size. For instance; your contact information or address should be large enough to read from a distance comfortably. Selecting an easy to read font that’s clean and simple is highly recommended as opposed to the cutesy cursive font. The more readable your vehicle graphics are, the more opportunities your business attracts. You’ll need to ensure that your vehicle graphics and wraps are well positioned on your vehicle if you are to attain your business marketing goals effectively. Avoid putting your message on areas that will make it difficult for people to read. Capture people’s attention by utilizing the rear of your vehicle effectively. If used properly, the back of your vehicle can be an excellent advertising space for making high impressions on those stuck in traffic or at a stoplight. Images are essential as far as vehicle graphics and wraps are concerned. Choosing the right photos can make all the difference for you. Ensure that your images are unique, relevant and of high-quality before adding them to your advertising. Don’t forget to ensure that your pictures conform to your brand and convey the right message about what you do to the people. The information you convey through your vehicle graphics and wraps must be relevant, clear and unambiguous. Your customers need to understand what your business is all about without breaking a sweat. Ensure that your contact information, address, location, and business name are visible and understandable. Choose a vibrant design and be consistent with it. The design you choose should be memorable, vivid and simple. For more effectiveness, desist from cluttering your precious advertising space with a complicated design and information elements such as intricate colors, images, and hand lettering styles. An overcrowded design can only complicate things instead of catching the attention of your target audiences. Just keep it simple, you’ll like it. While at it, ensure that you stick with the same design on all your fleet for optimal impact. Consumers are less likely to forget your message if you maintain consistency of design. In conclusion; choose your colors wisely, add a call to action such as “visit our website”, “Sign up”, or “Call us “and keep your message brief. 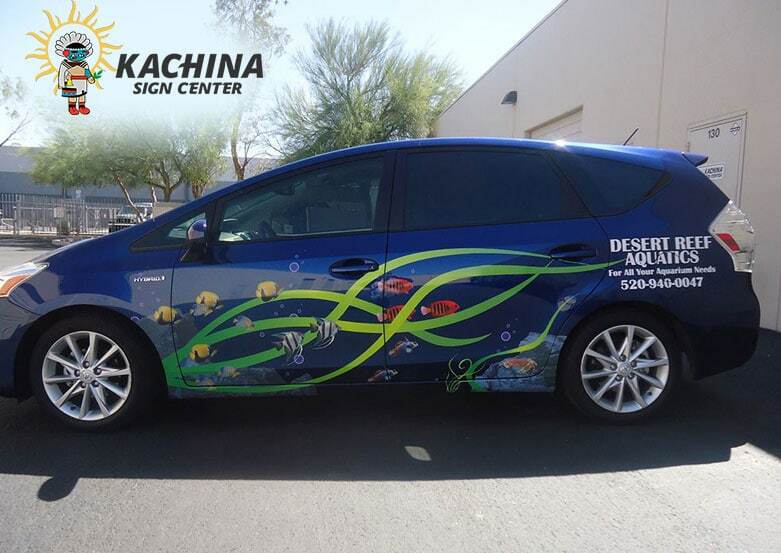 Are you in Tucson and you’re looking for high-quality vehicle graphics and wraps? Contact Kachina Sign Center, for the best-customized banners and signs in Tucson AZ.